Oh wow, just wow. I had seen this book floating, or maybe whizzing, around the blogosphere for what seems like forever. But I had put off reading it because there always seemed to be another book that just about managed to slide before it on my TBR list. Oh how wrong I was to let it wait. This book was a dream to read, it flowed beautifully and I gobbled up every word. WHY did it have to end?! 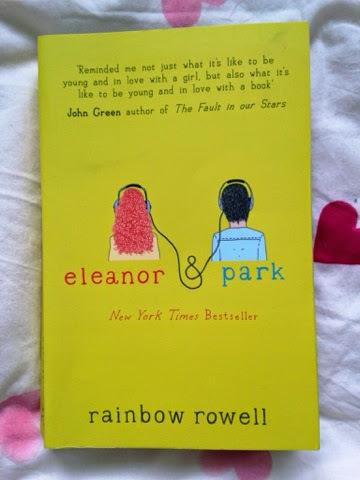 This book is told through both Eleanor and Park as they face the perils of teen life (oh yes how I remember those days). Park goes to a school where one of his most identifiable features is the fact that he is the 'Asian kid'. He has spent years perfecting the art of being invisible and he enjoys the perks that ensue, no eye contact equals no conversation and he has the luxury of a double seat on the bus all to himself. Or at least, that is, until Eleanor gets onto the bus one day. Unlike Park, Eleanor is hard to miss, ragged clothes in bright colours, a jumble of odd accessorises and a mass of red curls. With her comes the chaos of the bus dynamic, where does the new girl sit? Park gives up the seat beside him and in doing so sparks the catalyst of their friendship. A friendship full of comic books and mix tapes. But Eleanor has secrets she doesn't want to share, a home life that she hates, kids at school who aren't so accepting of difference. This is a story of first love, the rough side of being a teen, growing up in the sort of poverty that is rarely talked about. 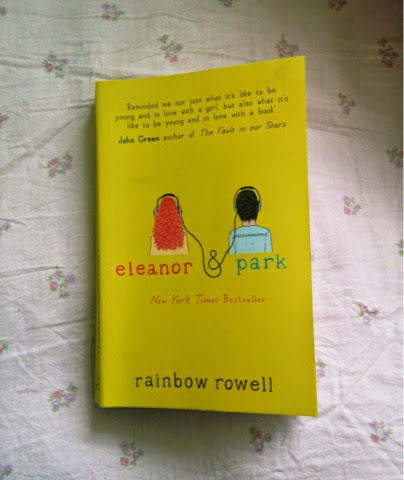 The characters of Eleanor and Park were beautifully created, Rowell left vibrant images imprinted on my brain and as a reader I love nothing more than a quality character description and these were superb. Whilst Eleanor and Park were the central characters, there were also a variety of equally intriguing minor characters: Mindy and Eleanor's younger siblings to name a few. Eleanor was strong and funny but not cutesy or sickly sweet which is a trait that teen love sick girls tend to fall into. The key to Eleanor was that she was relatable but also different enough to be intriguing, it was because of this that it was so easy to root for her, I wanted her to be happy, to be in love, to have everything she wanted. I cannot thank Rowell enough for giving both Eleanor and Parks point of views in the narrative. I loved that despite it not being a first person narrative, as the reader I really felt although I was getting the sneak peak into their lives, their thoughts and emotions. I also enjoyed what I see to be the quietness of the book, it was a very simple concept, the idea that two people slowly go from not speaking at all to forming a friendship and then to falling in love simply from spending the bus journey together. It wasn't action packed or full of melodramatic teens lamenting their love for each other. It was simple and had an every day feel about it, almost as though I could have been a passenger on the bus witnessing it with my own eyes. This book is a brilliant reminder of why YA fiction is so amazing. I don't care how old you are, this book will always be relevant. It'll have you crying and laughing, just as any good book should.